Mary Lour Retton is a retired American gymnast. She represented the U.S. at the 1984 Summer Olympics where she won a gold medal in the individual all-around competition and two silver medals and two bronze medals throughout the competition. She was the first American woman to win the all-around gold medal at the Olympics. Retton is married to Shannon Kelley. He is reported to have the net worth of $8 million. As of 2019, Mary Lou Retton has an estimated net worth of $8 million. She was the first female athlete to be pictured on the front of a Wheaties box. She has had various commercial endorsements which included bowling and shampoo. She has been an analyst for televised gymnastics. However, her exact figures of salary have not been disclosed. Her personal assets like her luxury Houston home has been taken into account for the estimation of her net worth. Mary Lou Retton is married to the Houston real estate developer Shannon Kelley. Her husband is a former University of Texas quarterback and the couple tied their knot in 1990. The two have four daughters of their marriage, Shayla, McKenna, Skyla, and Emma. They are still married to this day and have not had any issues in their marriage and family. 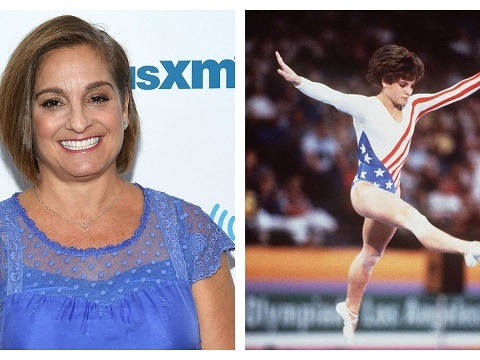 Mary Lou Retton Kelley was born on January 24, 1968, in Fairmont, West Virginia to parents Ronnie Retton and Lois Retton. For her high school education, she attended the Fairmont Senior High School. She joined the national team for the 1984 Olympic games during her sophomore year of high school. She enrolled in The University of Texas at Austin after the end of her career. Mary Lour Retton started training in gymnastics since the young age of eight. It was in 1983 that she was able to make a name for herself when she won the American Cup and placed second to Dianne Durham at the US Nationals the same year. She suffered from a wrist injury which caused her to miss the World Gymnastic Championships in 1983. She did win the 1983 American Classic and won the title the following year as well. Retton won her second American Cup along as well as the U.S. Nationals, and the U.S. Olympic Trials in 1984. She suffered from a knee injury and had to undergo an operation five weeks prior to the 1984 Summer Olympics. Despite a short recovery time, she was able to win the 1984 Summer Olympics which was a close competition between her and Ecaterina Szabo of Romania. She was the first American and the first female gymnast outside Eastern Europe to win the individual all-around gold. Aside from winning the gold in the individual all-around competition, she also won four additional medals, two silver and two bronze in the competition. She was named the Sportswoman of the Year by the Sports Illustrated Magazine. During her career as a gymnast, she won the American Cup all-around competition three times with her win in 1985 is the third and the last one. She retired from gymnastics in 1986. Post end of Mary Lour Retton's professional career, she was elected to the National Italian American Sports Hall of Fame in 1992. The release of a sports study in 1993 showed that she and fellow Olympian Dorothy Hamill were tied for the first place beating other famous athletes like Michael Jordan, Magic Johnson, Troy Aikman, and Dan Marino. She was inducted into the international Gymnastic Hall of Fame in 1997.